This personalized picnic basket promotes your brand fast – 24HR! The set-up charge covers the material and time to make the screen, pad or die that is needed to put your specific logo on a specific product. Each screen/pad/die is a unique physical piece for each design for any given product, so the first time we imprint a design on a product we need to make this piece. For some items, this is needed for each color in your design. However, if you reorder the same imprint on the same item you won't ever be charged again. Set-up charges are not connected in any way to artwork preparation – our artwork services are always FREE! Enjoy the outdoors to the fullest with this promotional picnic basket. This movable meal kit comes with a flat lid design along with two closure straps for easy transportation. 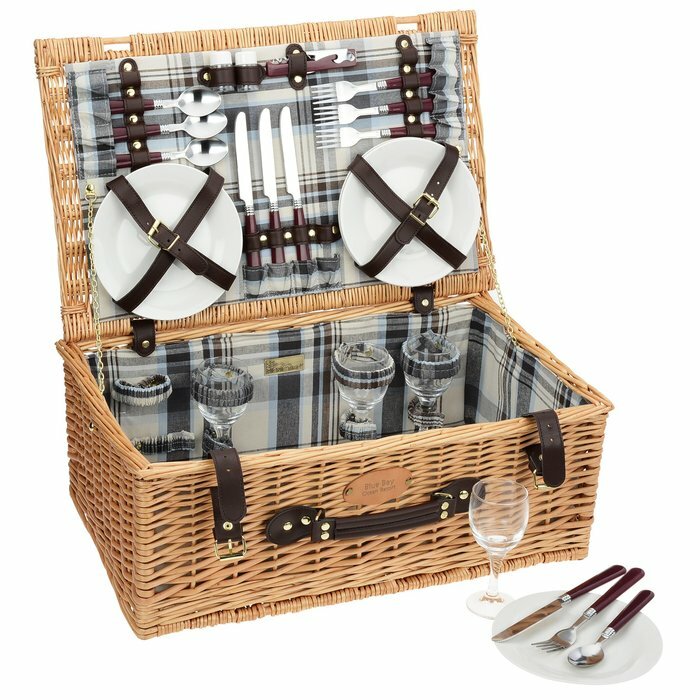 Made of willow, this imprinted picnic basket is extremely stylish. Within the stylish willow basket is a polyester lining which holds four of each of the following: wine glasses (4 oz. ), ceramic plates, stainless steel knives, spoons and forks. Amongst the various kitchenware is also a stainless steel waiter style corkscrew and a set of plastic salt and pepper shakers. Fully assembled, this breathtaking basket weighs approximately 9.5 lbs. Size: 8" x 20-1/2" x 13-5/16". Your price includes a debossed imprint centered on the oval patch.